The perfect solution to a busy lifestyle, Aromatherapy Associates’ Light Relax Bath & Shower Oil restores body and mind. A relaxing and uplifting formulation that harnesses the power of essential oils to ease tension, reduce stress and promote a restful night’s sleep. Expertly prepared with natural ingredients, Light Relax leaves your skin beautifully soft and supple, and your mind revived and renewed. Now I have tried many products that have really relaxed me and helped me wind down, but I have never tried a product that actually sent me to sleep! 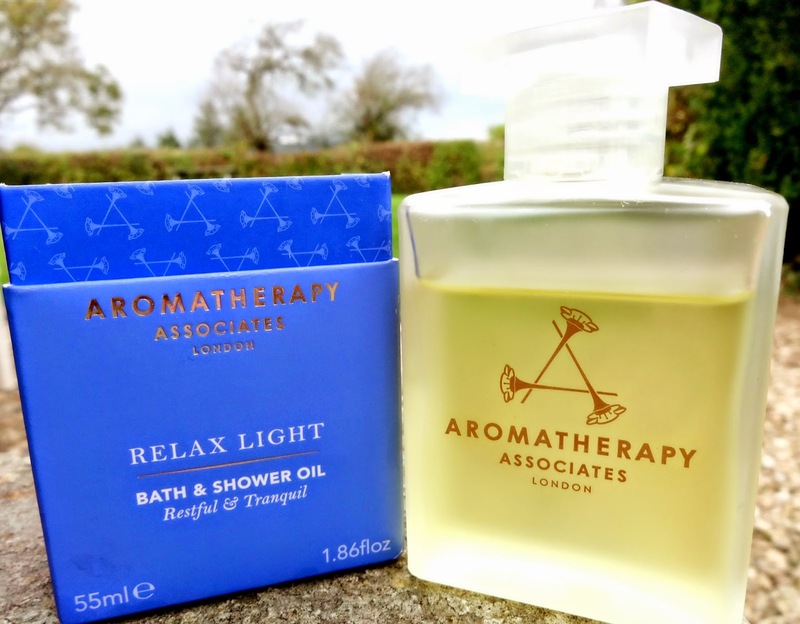 (until I tried Light Relax that is) The combination of Lavender, Ylang ylang and Petitgrain creates the perfect antidote to a busy day to day lifestyle! So now I will tell you a little more about what this product did for me the first time I used it. I ran myself a bath and told my boyfriend Daniel to put a programme on I really wanted to watch. Just as I was about to step into the bath I jumped out to go and get my Light Relax Oil from my bag! One cupful totally surrounded my bath and entire room with a deeply relaxing aroma, which made me actually want to just stay in the bath all night! I got out of the bath and within about 15 minutes of drying and getting into something comfy I was fast asleep on the bed.... So much for that programme I really wanted to watch haha! I decided to try the bath oil a few more times just to confirm that this stuff really was miracle working for me and I must admit it worked every single time. After stepping out of the bath I felt like the stresses of the day had completely drained out from me, to the point I was even too relaxed to worry about uni work haha! ( which is great.. as long as a deadline isn't looming the next day) I'm definitely going to be saving this as a treat for when I really need to relax and get a good nights sleep and have been really impressed by this product. This product has left a huge impression for me and has got me really interested in Aromatherapy Associates as a brand. I'm sure some of you will have seen their Christmas gifts, which are super cute and a less expensive way to try their products. Overall, Light Relax is a product well worth its price (£40.00) if you are looking for a real relaxing treat! It isn't cheap, but it will easily provide you with 20-25 experiences. It would also make a fantastic gift with Christmas on its way.. I already have someone lined up who I think would love it haha! I hope you have enjoyed this post and would love to hear from you in the comments section down below. Don't forget to leave your links and general comments/questions as I love hearing from each and everyone of my lovely readers! Hope you are all doing well? I have been super busy the past two weeks with some exciting plans at work and of course the not so exciting uni work haha! Its been so nice to spend a good old Sunday evening watching some TV and writing up some posts! I recently met up with one of my best friends Beth who I haven’t seen for over a year and a half! We went all through school together and always had so much fun hanging out. Beth went to Australia and ended up staying a little longer than I expected, so when I seen her the other day it was serious non stop chatting and of course catching up on all the time that has passed. As I work at the Celtic Manor I decided to put my staff discount into action for once and booked us both autumn afternoon tea. I know a lot about our afternoon tea’s, as I work quite closely with the marketing of them, but I have never experienced Afternoon Tea from a customer’s point of view. I must admit I was not dissapointed and had one of the nicest days I have had for a long time. I hope you enjoy today’s post lovelies and would love to hear your thoughts in the comments section down below. Don't forget to leave your links, so I can check them out tonight after the #bblogers chat! Firstly, we were served hot winter pimms, which was honestly one of the nicest drinks I have ever had. It was perfect for the occasion and made me feel all warm and snugly, especially as it was blowing a Gail outside. The next treat to be served was a delicious basket full of savouries, which also went down very nicely and the Y Fenni cheese rarebit on onion bread was delicious! I love trying new food, so it was really nice to sample some things I had never tried before, whilst enjoying the company of one of my best friends. The next part was definitely the most exciting as we were served a beautiful selection of finger sandwiches, cakes and macaroons. YUM. Whilst we were doing our best to sample all the lovely sandwiches and cakes, we were kindly offered tea and coffee, which was also a nice touch. Finally, we were served with homemade Blackberry and Vanilla scones, which were amazing! We honestly couldn’t get over the amount of delicious food we were eating all at once. There is so much food, which makes it definitely worth the £22 and I think its great that they also provide boxes to take any left over cakes/food home, so none of it gets wasted. It was a fantastic way to spend my day off work with my friend catching up with all our stories over the past year! The afternoon tea was a real treat and definitely makes the perfect way to celebrate an occasion, or even to be given as a luxury gift! Who doesn’t love eating amazing food? 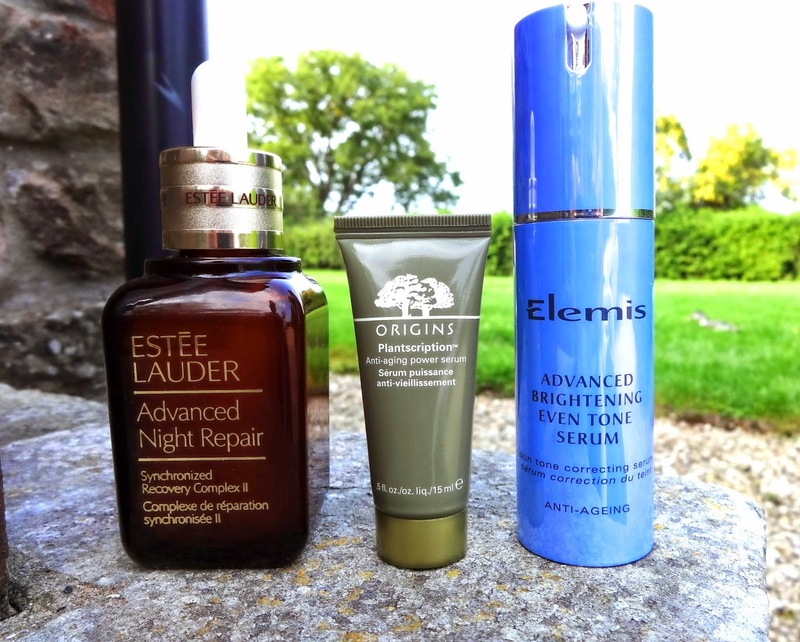 Today’s post is going to be about some lovely serums I have tried over the past year! They are all worth a mention and are all fantastic in their own ways. I actually worked for an Elemis Spa for over a year and was lucky enough to go on some really useful product and training days, which really helped me learn more about the skin and its needs. Serums are designed to be a lot lighter and fluid like, as they have to travel to the deepest levels of the skins dermis. Moisturizer’s are only really designed to address the initial layers of the skin, but by using a serum it helps to keep all layers moisturised, which normally results in a brighter and less dull looking complexion. I hope you enjoy this post lovelies and if you need my help or advice then please leave your comments down below, or why not contact me via my Social Media if you are looking for a quicker response :) I would also love to know your thoughts on the post down in the comments section and don't forget to leave your links too! If this isn't a magical anti-aging potion then I don't know what is! I first used ANR when I made a few cheeky Estee Lauder Makeup purchases and since my first little sample I have never looked back since. I must admit I was very jammy with Estee Lauder as it seemed every time I made a beauty purchase I got a free sample (which last ages) so I never had to buy the full size until recently my boyfriend treated me to the big 50ml bottle. when I haven't used it for a week there is a big difference! I tend to use this around three times a week and it really sorts my skin out. It smoothes out the complexion, as well as totally calming any redness or irritated spots. My skin always looks a lot healthier after using this product, especially when I use it consistently. ANR uses Hyaluronic Acid to lock in moisture, which creates the optimal condition for the skins natural renewal cycle.If you are looking for a serum that soothes, smoothes, plumps and perfects then this is by far the best Serum of the bunch! This is my current go to serum for day time use! My skin adores Origins and I don’t think I have ever reacted or have had a bad word to say about anything I’ve tried so far (touch wood). Plantscription is a serum that I have always received as a generous 15ml sample with other Origins products, but recently after using it more often I have noticed a great difference in my skin. This Serum is suitable for am/pm but I much prefer to keep ANR for the night and this little beauty for the day. It sinks in really quickly without any signs of residue and it works lovely under my other skincare and make-up. Like ANR this product focuses on anti-aging, which is something I have been interested in since I was 16! Plantscription uses 20 potent plant extracts including Anogeissus from Ghana, Africa, Bamboo and Pea Extract from Australia, Crithmum from France and Commiphora from India to name a few. Elemis is a skincare brand that is very close to my heart! not only did my gran love it, but Elemis as a brand really changed my skin and in ways my life! I started using Elemis around 3 months before I got a job in an Elemis Spa and working for the brand was by far one of the best experiences I have had! I learnt all about the brand and how what you see with Elemis is really what you get! There are no secrets and they spend huge amounts of money making sure their products are as natural as possible and compeltely cruelty free! I started using this serum around two months ago and it has been fantastic so far. Its the best for achieving brightening results out of the three serums, but it does work hard at renewing your skin.. which means it won't be your best friend if you like a face tan! It is proven to reduce the appearance of pigmentation after just 28 days. I can confirm I used this for just under a month and my pores and general look of my skin was a lot better and even looking! The only reason why I don’t use it as much is because I like to face tan and this serum does remove it, as its main aim is to perfect past imperfections, such as acne and dark spots. They are all fantastic in their own ways! If you are looking for a night product and want something to completely renew and refresh your skin for the next day I would 100% opt for ANR. If you wanted a good all rounder that could be used both am/pm then I thin the Origins Plantscription would be a great choice. However, if you were looking for a serum to help with darkness, acne or just to help you achieve a much brighter and smoother complexion the Elemis Advanced Serum is an amazing option. It really depends what you are looking for, but Serums are a fantastic way to nurture your skin and ensure that you skin is protected all the way through! Can you guess what this post Is about today haha! 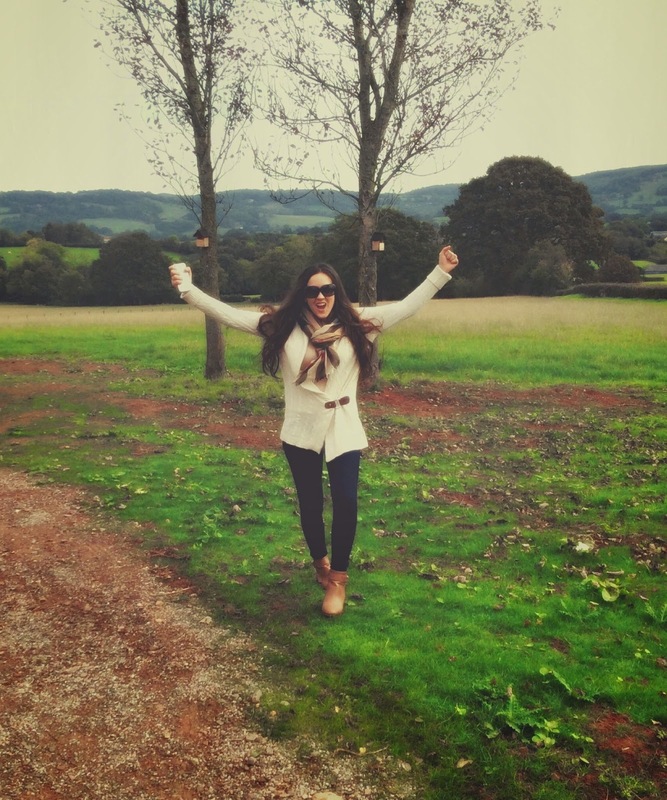 Woohoo Autumn is here! As much as I love the summer, light nights and of course plenty of BBQs. I have always felt more comfortable come autumn time. I love cosy jumpers, big knits, boots and plenty of warm drinks. I thought I would do a quick style/lifestyle post, as I don't do them very often and it feels like a nice change for my blog. Today, I visited the new development which my parents are working on and it's become a bit of a Sunday tradition to go and visit to see the progress. It's looking fantastic and looking over our beautiful land is such a relaxing experience, especially after a 6 day week at the marketing office. I must admit I'm looking pretty chirpy in the picture below haha, it was one of those ones which I was messing around with, but actually preferred it to the more "serious" outfit ones haha! In terms of make-up I'm always sad to let go of my peachy/coral's but I'm quite excited to start playing around with some more plum tones. I must admit plum on my lips is just a little our of my zone, but recently I purchased a plum eyeliner from Chanel (which I posted about) and I really liked the way it made my Green eyes pop! I tend to ditch all my other foundations for my YSL Le Teint Touche Eclat foundation in A/W as I love how dewy it looks on the skin and it also feels so soothing, especially after a few weeks of the cold and wind getting to my skin. I will be doing an Autumn Make-up post soon, so I will include some more tips and tricks in that post for you lovelies. I hope you enjoyed this more chatty post lovelies, sometimes its just nice to change things up and show you a little bit more of my personal side! Its not all makeup I swear haha. I love nothing more than a countryside walk and just chilling out on a Sunday with my laptop, family and a good cup of tea! I would love to hear from you in the comments section down below, what is your perfect way to spend a Sunday?